I was kind of late to learn how to swim as a kid. I was basically terrified of water for the better part of my youth. But whenever we went to the lake, I still lustfully stared at the other kids having SO much fun as they got towed behind their family boat on their inner tube. This was all, of course, despite the fact that had I actually ever been invited, I would have quickly declined out of sheer terror. It’s true, I was jealous. And now as an adult-no longer afraid of water and just fine at swimming, I’m still looking at kids zipping around the water on these things and wishing I was out there. Point being, if you have kids, teach your kids to swim and if you’re going to rent a boat at the lake this summer, you simply have to get a towable. You just have to. I am encouraging you to be the coolest parents at the lake and make your kids the envy of all their friends. But where to begin? Towables have come a LONG way since the plain black inner tube. There are so many different kinds of towable tubes. Which one’s are safe for kids? Should you get one that holds a lot of kids? Or just one at a time? They come in all sorts of shapes and sizes, but what are the best? 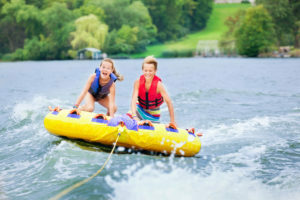 Let’s dig through the many options to find out what are the Best Towable Tubes for Kids.